If you were to ask someone what they recommend for a travel case to house their camera gear while on the go, there’s a good chance they would recommend something from Pelican. I’ve used them myself and can tell you that I would trust no other brand to protect my delicate camera equipment like they can. They’re built rugged and made to last. Now, and hear me out on this, Pelican is ready to protect another important asset of yours on the go: beer! Or, if beer isn’t your thing, whatever else you want to keep cold. 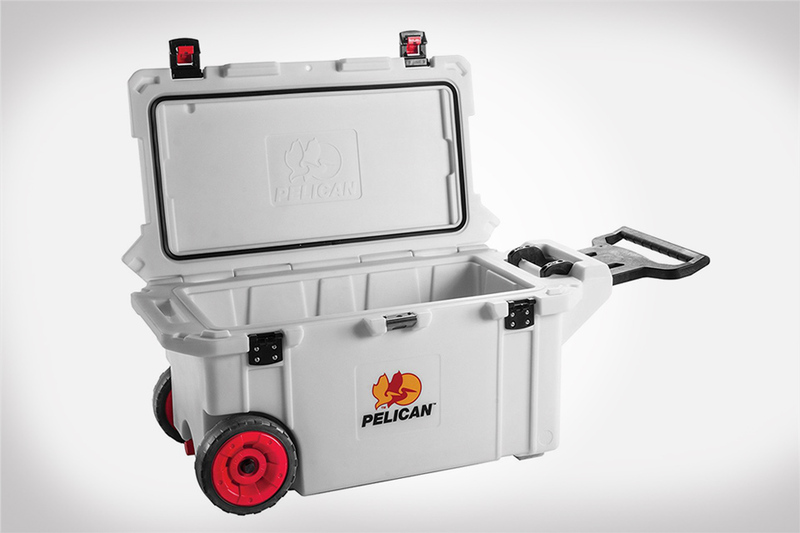 The Pelican Elite Wheeled Cooler is the only cooler you will ever need to buy. It features reinforced corners and thick walls to help insulate better for longer ice retention while also protecting from impact. How long you ask? How does up to 10 days of ice retention sound to you? Additionally, the cooler also has molded-in tie downs, press & pull latches (wide for gloved use), integrated fish scale on lid, heavy duty wheels, and a built-in bottle opener–all of which comes with a lifetime guarantee. See the full specs of the Pelican Elite Wheeled Cooler over on Amazon.